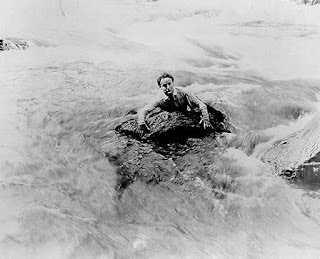 Recently, I got to thinking about the famous image of Houdini holding onto a rock at Niagara Falls. As I pondered the drama in that photo (see below), I suddenly began to see all these various connections in the magic world to this beautiful natural treasure of scenic beauty. However before we can get to the magicians, I need to point out the daredevil who started this whole Niagara Craze. Her name was Annie Edson Taylor and she was born in 1838. 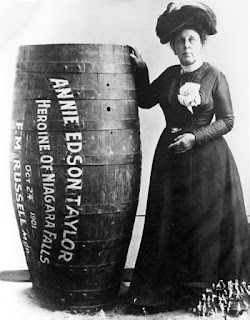 At the age of 63 she decided to attempt going over Niagara Falls in a Barrel. She thought it would leave to fame and fortune. On Oct 21st, 1901 Annie made her attempt. And after 20 minutes her barrel was seen bobbing up in down in the water below the falls. She was alive and came out of the barrel unscathed except for a cut on her chin which happened when the lid was being removed from the barrel. Annie Edson Taylor was the first person to go over Niagara Falls and live. She would repeat the stunt a few years later at another falls. Though she did gain some modicum of fame from her daredevil stunt, it did not really lead to the kind of riches she had hoped for. She died in poverty in 1921. 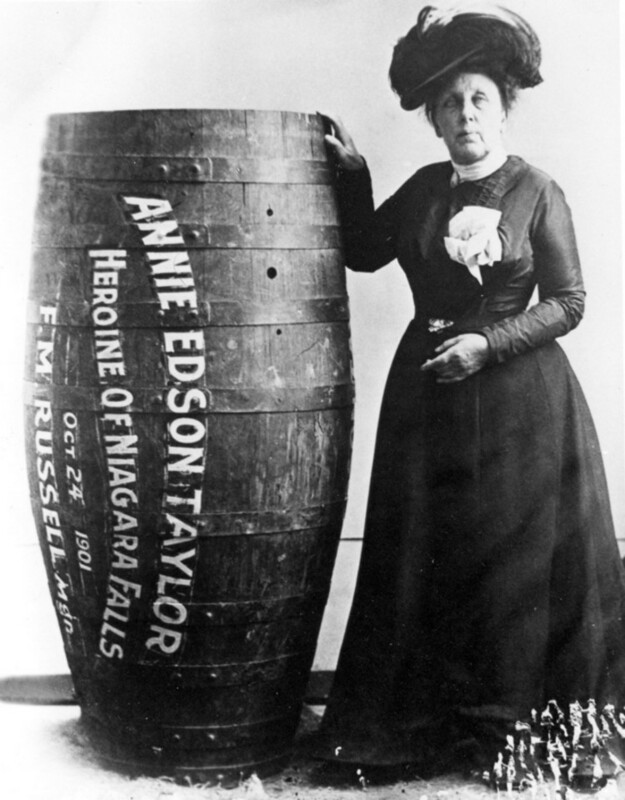 Annie's success started a fad of going over the Falls in a barrel and many others followed her daring feat. Some were successful and some died in the attempt. According to biographer, Milbourne Christopher, Houdini had plans on presenting a spectacular escape at the Falls by being placed into a packing case, sent over the Falls where the crate would smash to pieces on the rocks below and then when it seemed there was no hope for Houdini to be alive, he would mysteriously appear on the shore, to the delight of one and all. But this escape was never presented. The 'stunt' can also be found in Walter Gibson's book, Houdini's Escapes and Magic. Gibson points out that this was an idea, a concept for an escape but it didn't go far beyond the idea phase. 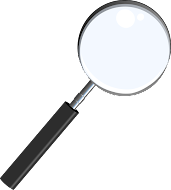 I tend to think that given the fact that the stunt had been successfully presented by several other people and that some had died in the process, it would put Houdini more in the realm of copying what someone had already done and I don't think he would have done that, and may be why the 'idea' never went anywhere. Rather it would seem that Houdini's Niagara Falls adventure begins with the filming of The Man From Beyond. The film had several locations including Lake Placid, NY, Fort Lee, NJ, but the climactic scene with Houdini rescuing the heroine from going over the Falls at Niagara took place at the actual Falls in Ontario. Houdini would be performing some fairly dangerous stunts, like swimming in and against the current to save the damsel in distress. Despite having a safety line attached to him, it was still quite dangerous. I should note, that though Houdini never did the escape as listed in the previous paragraph, we do at least have the film footage of Houdini in Niagara from The Man From Beyond. Fast forward to June 6, 1968 and Houdini again appears in Niagara Falls Ontario. This time in the form of the Houdini Magical Hall of Fame. For many years, this Museum would be the place that stored and displayed many of Houdini's famous escapes, including The Water Torture Cell. In 1995 the museum burned to the ground in a mysterious fire. The carcass of the Water Torture Cell was later sent to John Gaughan in California where he amazingly restored the cell. 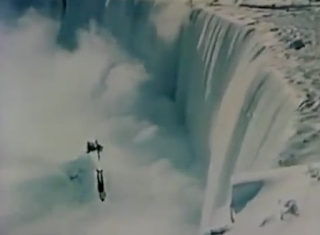 In 1978, for the filming of a magic documentary, James Randi, the escape artist and famous psychic debunker, escaped from a Straitjacket while hanging over a freezing cold Niagara Falls. It was so cold during taping that Randi wore a ski mask to cover his face. He also wore thermal underwear, and if you watch the footage captured on the documentary Houdini Never Died, you'll see Randi having a bit of trouble getting out of the jacket at the end. No doubt the cold and the extra clothing added to the escapes difficulties. 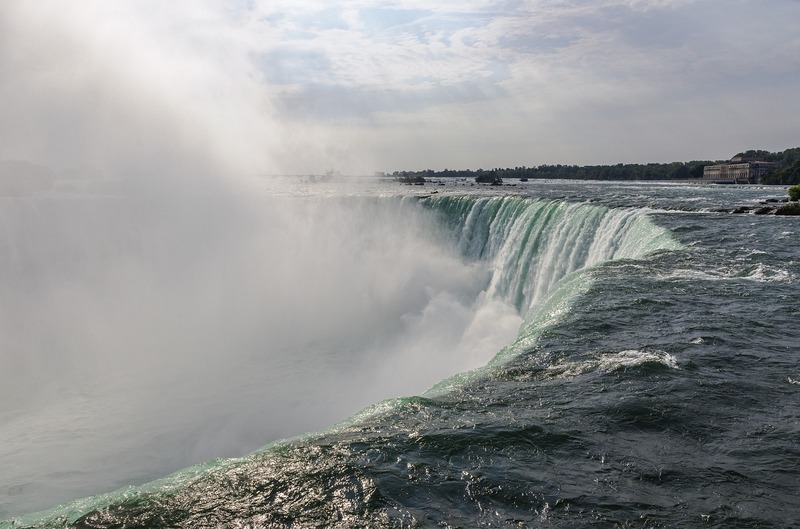 In 1990, for his 12th annual CBS special titled The Niagara Falls Challenge, David Copperfield would close out a special filled with fantastic magic, with an escape that had him apparently going over the Falls in some sort of metal container strapped to a raft. I didn't feel it was his best closer, but not because the escape was weak. In my opinion what made the whole thing weak was the reveal of Copperfield hanging from a helicopter by a wire. He should have taken a page from Houdini's notebook and appeared on the shore or at least swimming to the shore. Still it added another magic feather in Niagara's cap. The final magic connection is still there, it's the Greg Frewin Theater, owned and operated by magician, illusionist Greg Frewin. Though he became famous for his incredible Dove Act, Frewin has presented Houdini-like escapes in the past. The most notable escape was a packing crate escape presented on the Champions of Magic over the French Riviera in Monte Carlo. UPDATE: Wait, hold the presses!!!! I just found out one other connection (sort of). It turns out the Niagara Falls area was the final destination of the proposed VEDA-LAND amusement park. This was the TM Amusement park that Doug Henning left magic to spearhead. Of course, it never happened because Doug died before Vedaland was built. And I have my doubts it ever would have been built. But I'll save that conversation for another time. 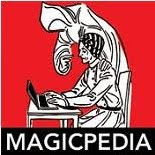 In the past 100 years, Niagara Falls has drawn, daredevils going over the falls in barrels, giant rubber balls, large metal cans, there have been daredevils who have walked via tight rope OVER the Falls, and of course, you've read above about the various exploits of the magicians. 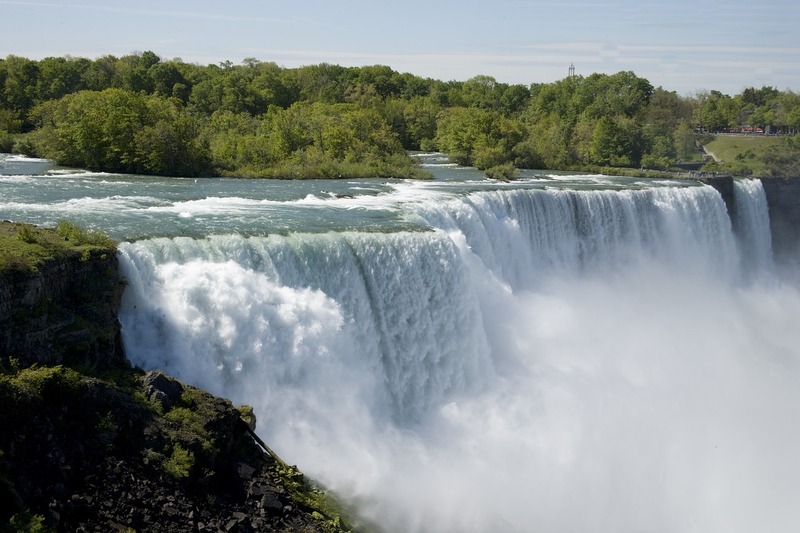 Perhaps, the most magical thing about this location is simply the breathtaking beauty of Niagara Falls itself.